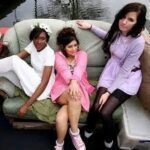 The Tuts are three skinny teenage girls who create a great rocket. Dealing the punk rock card they hit the Leftfield stage with a handful of songs that combined great surging tunes and a youthful guitar powered optimism that sounded thrilling. This is skin of the teeth stuff- that beautiful moment when music tilters on the edge of chaos but, somehow, always holds together with its collapsing racket. The Tuts are dressed in lo fi glam and try to defy the dark sky and the glowering elements with their music. The crowd are more than receptive as the songs thrill and the fab tinny choruses are bolstered by their tight harmonies delivered in old skool punk rock style. It’s all going so well until a freak electric storm conks out the PA and there is a 30 minutes break leaving the band stranded on the stage and the audience drifting away thinking the gig is over. When they return to an emptier tent they still play with all their hearts and it’s a heart warming celebration of the power of music and the redemptive force of electric punk rock from a young band with big songs.